Architect Pedro Scattarella is no stranger to creating innovative interiors from recycled materials. 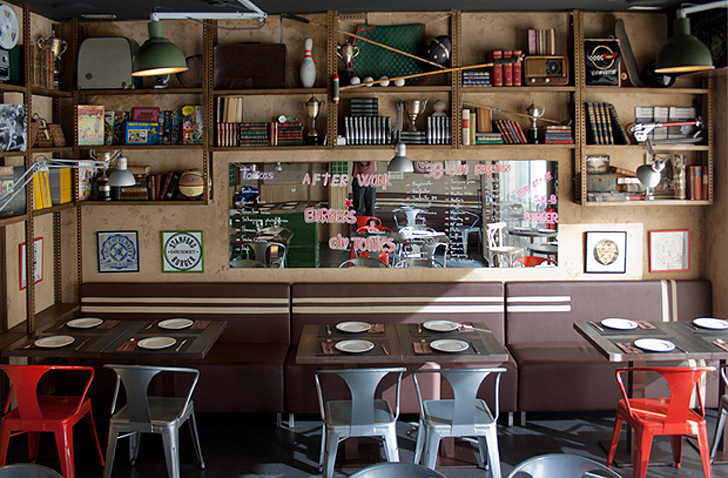 Applying his quirky and rustic aesthetic, he has transformed the interior of Stanford Gourmet Burger into a welcoming restaurant rife with nostalgia. Using a combination of found objects, trash and IKEA elements, the small restaurant evokes a 1970s university café, effectively serving patrons an art installation along with their tasty burgers. A firm believer in sustainable architecture, Scattarella transformed the café into a vintage burger joint that was meant to activate the local area, bringing more businesses and foot traffic to the street. In order to entice customers, the Stanford first needed a killer burger, and then an appealing aesthetic that would draw in passersby. Scattarella was further challenged to this task by having an extremely limited budget to work with. Believing that it is an architect’s responsibility to design spaces that make a difference, working with recycled materials was a no-brainer. Reutilizing found and vintage objects also creates an environment of familiarity that warrants a lively narrative for a lunch hour or meal. The metal shelves that line the café were all purchased at a salvage store, sold by weight. The tchotchkes stacked on the shelves, and thus decorate the interior, were all found in attics and second hand stores. The lamps are a combination of Scattarella’s design, coupled with arms from IKEA desk lamps, which drove the price down by almost 5 times in order to stick within the budget. 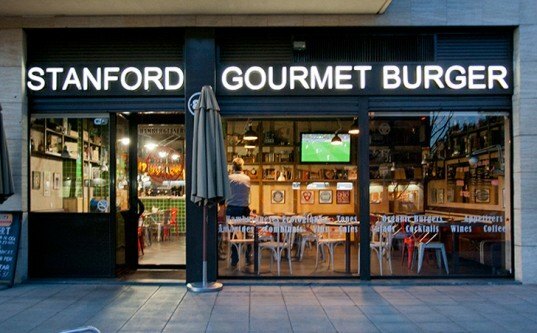 Thanks to these recycled architectural elements, the Stanford Gourmet Burger is at once familiar and welcoming, a place that diners feel comfortable to sit and relax in, as is evident by its constant thriving customer base. A firm believer in sustainable architecture, Scattarella transformed the café into a vintage burger joint that was meant to activate the local area, bringing more businesses and foot traffic to the street. In order to entice customers, the Stanford first needed a killer burger- and then an appealing aesthetic that would draw in passersby. Scattarella was further challenged to this task by having an extremely limited budget to work with. Believing that it is an architect’s responsibility to design spaces that make a difference, working with recycled materials was a no brainer. Reutilizing found and vintage objects also creates an environment of familiarity that warrants a lively narrative for a lunch hour or meal. The metal shelves that line the café were all purchased at a salvage store, sold by weight. The tschotskes stacked on the shelves, and thus decorate the interior, were all found in attics and second hand stores. The lamps are a combination of Scattarella’s design, coupled with arms from IKEA desk lamps, which drove the price down by almost 5 times in order to stick within the budget.